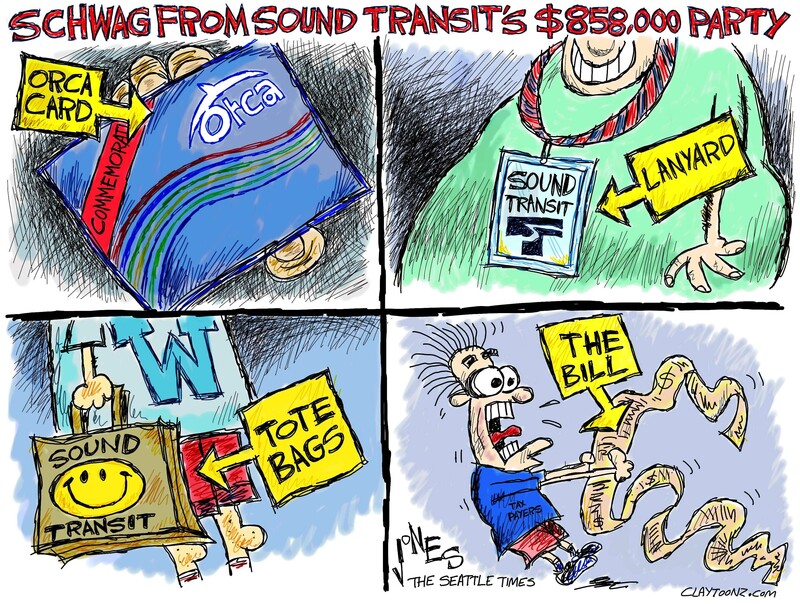 This cartoon is on today’s opinion page of The Seattle Times. It accompanies their excellent editorial. Twenty-one people have been killed and eleven injured in seven mass shootings in Western Washington just this year. 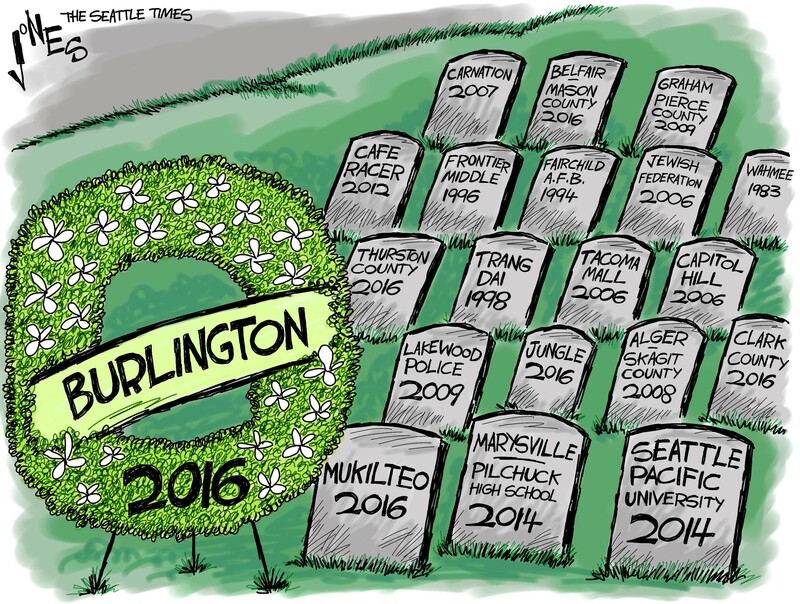 I drew this for The Seattle Times, which they ran Thursday. Sound Transit threw a large party to open new light-rail stations. 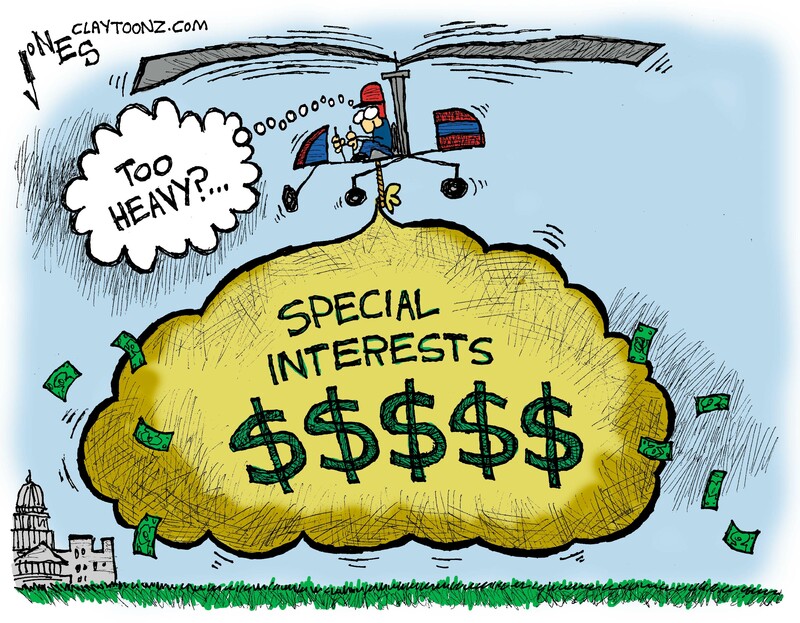 The party costs taxpayers a whopping $858,000. Those attending were given nice schwag such as tote bags, wallets, lanyards, a commemorative pass. The argument for the party is they need to promote the station so people will use it. Really? It seems people would know there’s a new station in their neighborhood. Ridership has reportedly increased by 25,000 but I doubt that’s because there was a party. On top of all this the agency is asking for an additional $50 billion. Those better be some very swanky tote bags. Creative note: When my editor approved this she asked if it was “schwag” or “swag.” I told her it was “schwag” and that I double checked before I sent it to her, but I asked that she and her staff check again just to make sure. I’m always paranoid to tell someone I’m correct about something, even when I’m sure, to find out after publication that I made a mistake in my research. Her assistant assumed it was “swag” since her heard it in a Justin Beiber song. What the? We don’t trust Justin Beiber. What is he, Wikipedia now? I told him to check again and he found the same results I did which is that schwag stands for stuff and low-grade marijuana. Learning it meant low-grade marijuana was news for both of us but I kinda figured the word had a pot connotation. I’ve known this smelly white dude with dread locks for years who is nicknamed “Schwag.” Nice guy. He’s always mellow. Today’s cartoon for The Seattle Times. 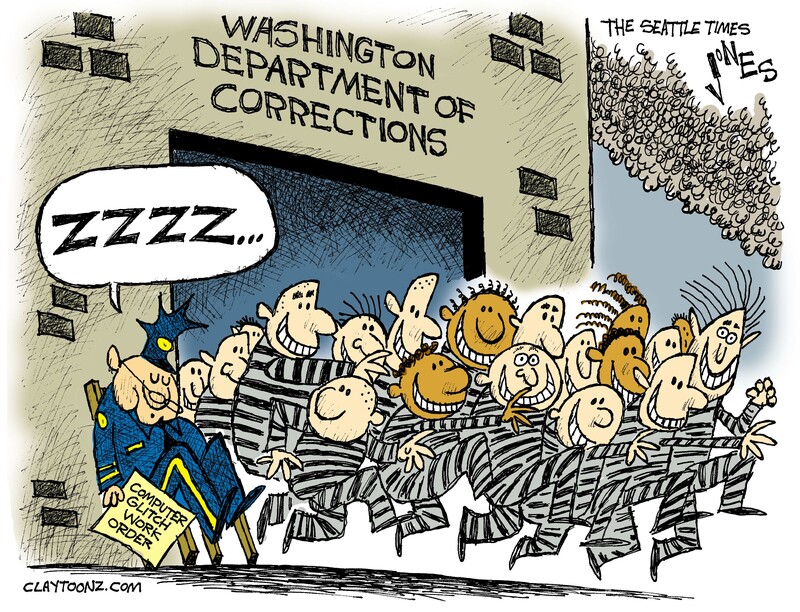 There was a software glitch in Washington’s Department of Corrections that allowed a LOT of inmates to be released early. It was so alarming to the department that they ignored it for three years. President Obama visited families of the victims of the Oregon shooting last Friday. There were protest. Why would anyone protest the president visiting families to express his condolences? Why indeed? Because they’re mad the president wants to take away their guns. The protesters speak of their gun and killing furry animals culture and they believe Obama wants to end that. Obama has actually voiced support for their hunting culture. Usually when one hunts (animals), the weapons of choice are shotguns, rifles, or a bow of some sort, not semi-automatic weapons, so hunters are safe from the prez taking their guns. The president isn’t even trying to take away their semi-automatics. 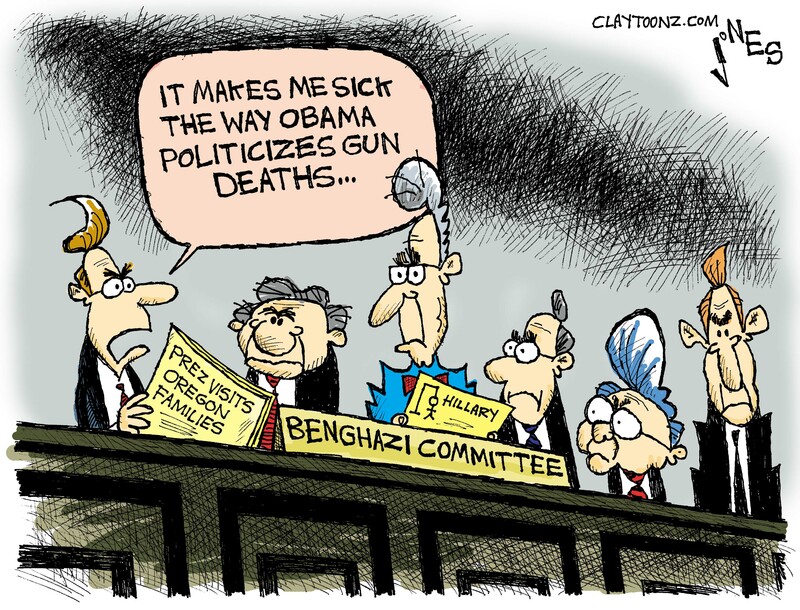 Meanwhile in Washington, D.C., more fun from the Select Committee on Benghazi. Republican representative Kevin McCarthy swears it’s not a political witch hunt, after he blurbed out it was a political witch hunt designed to destroy Hillary Clinton. Now a fired investigator for the committee is spilling the beans that it is indeed designed only to destroy Clinton. Many say you can’t take his word because fired people are always upset and try to drag down those who fired him. True. But he is a Republican. The investigation into Benghazi has so far costs $4.6 million. The attack on Benghazi resulted in the death of an ambassador, U.S. Foreign Service Information Officer Sean Smith, and two private CIA contractors. Do you know how many private contractors died in Iraq? As of June 20, 2012, 1,569 American contractors have died in Iraq. Where is the outrage? Where are the investigations? Why aren’t we looking for scapegoats? The president admits he is politicizing gun deaths. He wants change to current gun laws so there will be fewer gun deaths. Will the Benghazi investigation prevent more deaths of Americans on foreign soil? Or is it just designed to destroy one politician the opposing party dislikes? Conservatives, you have Fox News to assist in your take down of Hillary Clinton. You have Breitbart (if you have a hankering for some racist comments from right wing trolls read the comments under any Breitbart article). You even have that One America Now network (I know nobody watches it but you should visit it one late night for hours of stupid). If nothing else, there’s a gazillion right wing racist trolls on social media to help you. So take the advice from The New York Times editorial page and end your stupid committee. Plus, if Hillary is such an awful candidate, who can’t be elected, who you’ll beat so easily, who’ll eventually destroy herself because she’s untrustworthy, then you don’t need to spend $4.6 million of our money to destroy her.